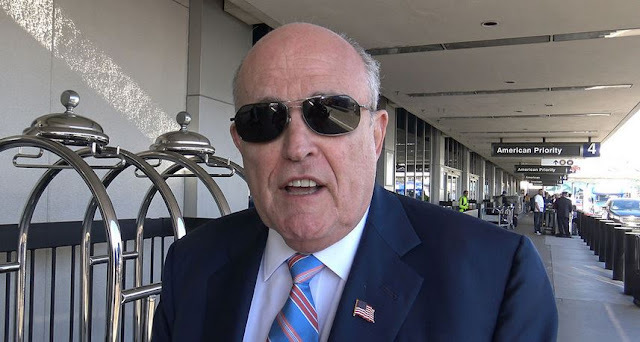 Rudy Giuliani must have spent Tuesday night pounding Red Bulls and Limoncellos because he went on a verbal tear on Wednesday morning that damaged his client Donald Trump and possibly the cause of world peace in half a dozen different ways. Even for Rudy it was an astonishing performance that left his hosts and the audience staring at him as if he had lost his marbles. This "talk" took place at the Globes Capital Market Conference in Tel Aviv, where the agenda was supposed to be "forecasts for the US market, the hottest real estate investment trends, and how the political changes will affect the markets." Why they thought Giuliani would be a good choice for that in the first place is a little hard to understand ,but they couldn't possibly have been prepared for him to shoot his mouth off the way he did. He said many outrageous things, but the most consequential is likely to be what he said when asked about the summit with Kim Jong Un being back on track: "Kim Jong Un got back on his hands and knees and begged for it, which is exactly the position you want to put him in." When asked by reporters about that comment later, he didn't back down. He said he was "pointing out that the president is the stronger figure and you’re not going to have useful negotiations unless he accepts that." That is an extremely insulting comment, needless to say. In any culture, suggesting that someone was kneeling and begging on hands and knees is provocative, but it will be seen as especially offensive to this particular head of state. Giuliani basically called Kim a sniveling supplicant. As we've come to expect, Giuliani was lying. There is no evidence at all that the North Koreans came begging to restart the talks. It would be very much out of character if they did. As I write this, I have seen no word of a response from North Korea to Giuliani's slam, so perhaps they'll let this one go. But they were certainly displeased with National Security Adviser John Bolton's snide comment that the U.S. was using the "Libya model" for the talks. This was logically interpreted to mean that the American team planned to offer economic aid to North Korea in exchange for giving up their nuclear program -- then renege on the deal and pave the way for Kim to be overthrown and killed in a ditch. State Department officials believe National Security adviser John Bolton made “Libya model” remarks deliberately to blow up the North Korea talks, according to several sources familiar. Bolton’s concern was that talks would not go in the right direction for the US, sources said. If this is true, Mike Pence was on board because he used the same language -- as did Donald Trump, although he made it clear he had no idea what the Libya model actually was. Apparently it was Secretary of State Mike Pompeo who smoothed things over after Trump wrote his petulant letter calling off the summit, and he has managed to sideline Bolton from the negotiations with North Korea. Now we have Rudy Giuliani trash-talking Kim Jong Un at an overseas conference. Occam's razor suggests that Giuliani just put his foot in his mouth, as he does several times a week. On the other hand, he's reportedly close to Bolton and, like him, is a big fan of regime change as the primary method of dealing with foreign adversaries. So perhaps they decided together to take a second shot at blowing up the talks. Who knows, maybe the president is unhappy with the pageant planning and dispatched his lawyer to insult Kim in hopes of making him pull the plug. With these people anything is possible. Does he have the power to do it? Yes. Is he going to do it? No. . . . He's innocent. He hasn't done anything wrong. The president of the United States -- they are a group of 13 highly partisan Democrats that make up the Mueller team, excluding him, are trying very, very hard to frame him, to get him in trouble when he hasn't done anything wrong. That language isn't an accident. A recent poll showed that 61 percent of Republicans and 25 percent of independents already believe the FBI framed Trump. It isn't much of a stretch for them to think the Mueller investigation is in on the scheme now. Still, this is an ugly accusation coming from the president's lawyer in a foreign country. But it's the kind of thing the president himself tweets out on a daily basis, so it isn't exactly destroying the dignity of the office. That ship sailed on Jan. 20, 2017. I do not know if he [Putin] wanted Trump, as much as he wanted to show that he had influence. He thought that Hillary would win, so maybe he tried to soften her victory. I would not want to bet on what he had there. But maybe the Russian government had the emails, maybe the Chinese, maybe the NSA, who knows? I think that in the West Wing of the White House, too, they understood what a scoundrel candidate she was. This is the first I've heard of the possibility of the Obama administration ordering the NSA to hack the DNC and give the emails to WikiLeaks, if that's what he's suggesting here. It's not easy to keep up with the latest Fox News punditry. When you look at Stormy Daniels (eye roll) . . . I know Donald Trump and look at his three wives. Beautiful women, classy women, women of great substance. Stormy Daniels?. . . Explain to me how she could be damaged. I mean, she has no reputation. If you're going to sell your body for money, you just don't have a reputation. He offered no word on what to call someone who sells out his reputation defending the indefensible, crotch-grabbing Donald Trump. You thought I was joking about the Red Bulls and Limoncellos. I don't actually know if that's his pick-me-up of choice. But something is. The following footage of Rudy, waving a napkin over his head while partying down to some EDM with a group of young ladies in Tel Aviv, was posted to Twitter by Yael Freidson, a reporter for the Israeli newspaper Yedioth Ahronoth. He's having the time of his life.